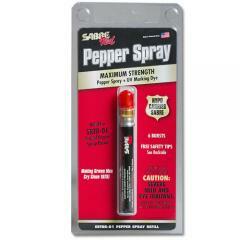 The Red Tactical OC Pepper Spray Baton Refill serves as a replacement canister for the SRTB-01 Tactical Spray Baton from Sabre. It contains .4-ounces of formula, enough for around eight quick bursts at an effective range up to six feet away. The cone-shaped delivery pattern ensures maximum accuracy with little effort. The potent formula contains 1.33% major capsaicinoids, impacting the eyes, nose and throat, serving as an extremely effective method for immobilizing hostile attackers. The added ultraviolet-marking dye offers easy police identification of suspects. The durable, aerospace-grade aluminum construction is sealed with O-ring aircaps, ensuring contents will not burst or leak while in transit. NOTE: Will not ship by air or to a P.O. Box. Continental USA only.